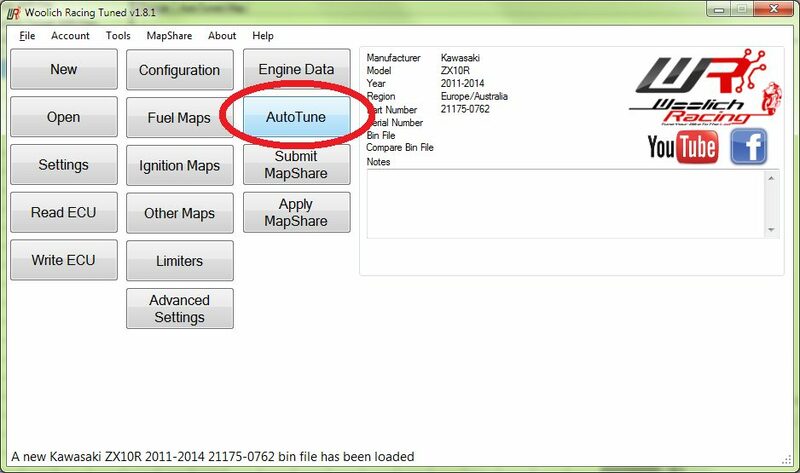 AutoTune is a component of the Woolich Racing Tuned (WRT) software. It allows you to aim for a specific air fuel ratio (AFR) at various throttle/RPM combinations. Why would you want that? Simple. Bikes are generally sent out of the factory with an AFR which is best for the environment and not necessarily best for smooth riding nor for maximum performance. Typically too if you modify your steed to take more air in (race air filter etc) or more easily exhaust itself (slip on, silencer insert removal, full system, boom box delete etc etc) then you will need to change your AFR. Why? You’ve changed the stock AFR by allowing more air into your engine or by changing the back pressure of gases leaving your engine. What is an AFR and why should I care? Easy, Wikipedia is your friend. Yes, there are equations on that page. The key takeaway is that your engine burns fuel mixed with air. There’s a “perfect” or optimal ratio of air and fuel which burns the most amount of fuel, that perfect ratio though doesn’t give you the most power, nor does it necessarily allow your engine to live as long as you’d like. If you’re interested get your hands on Martin’s book for far more detail on this subject. OK, I get it. I want to optimise my AFR for maximum power and smooth delivery. It’s straightforward and easy, isn’t it? That depends. The most power comes when you have slightly more fuel in the mixture than is capable of being burnt. The opposite is too much air when you get a hotter explosion which could prematurely wear your engine. Too much fuel and it won’t ignite “properly”, too little and you’ll be doing an engine rebuild. So, what’s the ratio I should shoot for? That depends too. On the type of fuel (eg. blended with ethanol AKA sugar fuel), the air pressure and the temperature at the time. 14.7:1 (14.7 parts of air to one part of fuel) is the ideal or stoichiometric AFR when all the air and fuel are consumed during combustion. The rule of thumb for today’s motorcycle engines is that between 12.8:1 and 13.4:1 is the ideal ratio for normally aspirated engines, super or turbo charging or using different fuels will change that ideal ratio. Right. That makes sense. Now what? You may want different AFRs depending on what throttle position/RPM you’re at. Huh? If you’re humming along the freeway in 6th gear at 4k rpm you may not want or need the most power possible from your engine, you might want the most economy. And here you might therefore want to set the AFR closer to 14.7:1. Damn. And I thought this was going to be easy. It is. sort of. So, how do I get this perfect for me, depending on what I’m doing with my bike AFR thingy? First off, get yourself a wide band oxygen sensor so that you can know what the AFR is at any given time. Awesome. I want one. Easy. Well, actually no. It’s not that easy. Your AFR varies depending too on how hot your bike is. Say what? Yep. If your bike is stone cold having sat outside all night in freezing temperatures then it needs a different AFR to start easily. Argh. It gets better though: your bike’s ECU can tell that the engine is stone cold and modify the AFR accordingly, then when you reach an optimal engine temperature it can vary that AFR again. Why would I even need to know that? You will, just keep reading for now. Back to wide band sensors. Yes, you’ll need to get one. But doesn’t my bike come with an O2 (oxygen) sensor? Yes, it will very likely come with one (some bikes sold in some geographies don’t come with one at all though), but if you do have one, it’s very likely to be a “narrow band” O2 sensor. Uh huh. Sounds awesome. No, not really. These narrow band sensors can only tell if you’re very, very close to 14.7:1. Wide band sensors will typically give you a range from 20:1 down to 10:1. Cheap. Yeah. Annoying. Yeah. But you’ll need a wide band sensor if you want to stand a snowball’s chance of getting your AFR “right”. Argh. Right-o. I’m getting or have now got a wide band sensor like the awesome Zeitronix unit which Justin Woolich has available for sale. Now I’ll know what my AFR is and can tune my bike accordingly. Not quite. You’ll either need a display unit or some way of logging that AFR while you’re riding. Let’s start with the display unit. Neat. I get a new dial gauge or LED display for my bike. Folks will see the numbers dancing and I’ll look properly pro. Sure hope you’re able to remember all the numbers though as they change several times a second and can change quite radically when you roll off, change gears or roll on etc. OK. A Display is nice to have, but I’d better get something to log/capture the AFR. Enter stage left Justin’s Log Box Pro. These units will capture your AFR as you ride. Perfect. Now we’re talking. Easy tuning. Yes, no and it depends, sort of. Then go to the “target AFR” tab and set your target AFR for IAP and then TPS. Like say what? IAP is the inlet manifold pressure, inlet absolute pressure, or MAP (Manifold Air Pressure) map, yes, it’s called lots of different things by different manufacturers but it’s all the same. Right, got that but I’m still like “WTF?”. 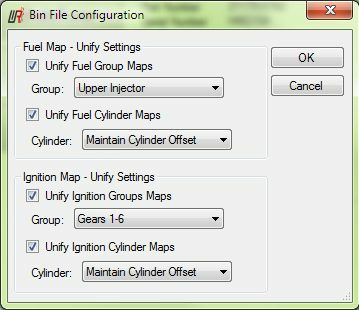 Basically you have two types of fuel map. The IAP map which is for below 10% throttle which is gradually blended into the TPS (throttle position sensor) map at around 10%. Wicked. The TPS map differs depending on the RPM and the amount of throttle position. This is where you set the AFR for various combinations. Your IAP and TPS target AFRs can be quite different. You can open one log file at a time or several log files all at once. To select several log files at once hold down the “CTRL” key on your keyboard while clicking on the file names for the files which you’d like to load into WRT to analyse. Colourful, yes, it is. So what exactly am I looking at? Down the left hand side of the screen you can see the RPM going from 600 to 15,000 and along the top you can see the IAP going from 80 to 0.0. Inside the cells you’re looking at a bunch of numbers in black with a red or blue background. These red and blue backgrounds vary in intensity to make it very easy to see where you’ve got too much or too little fuel for your nominated AFR. 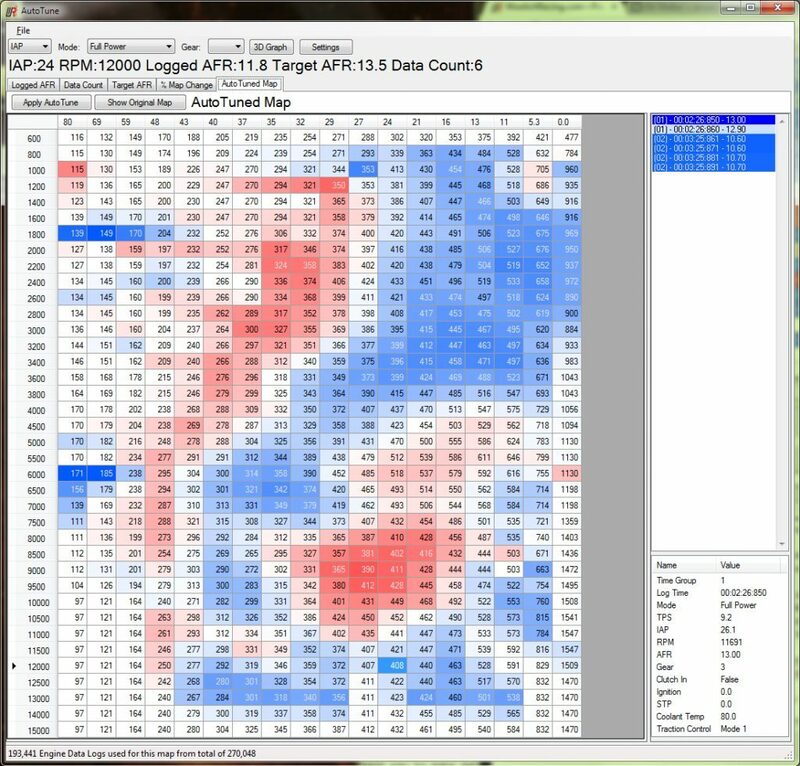 The red color in the WRT software indicates a lean AFR, and the blue ones a rich AFR. That’s why in the map change screen you will see positive numbers like “10” in the red cells because red is lean and the software suggests you should add fuel (and you should). Notice how you won’t have a number in every cell? That’s because it’s extremely hard/almost impossible to get a reading for every cell in the IAP map. There’s a bunch of reasons for this, just accept that you won’t have a number in every cell. I’ll go into what makes “good” and “bad” data in another article. 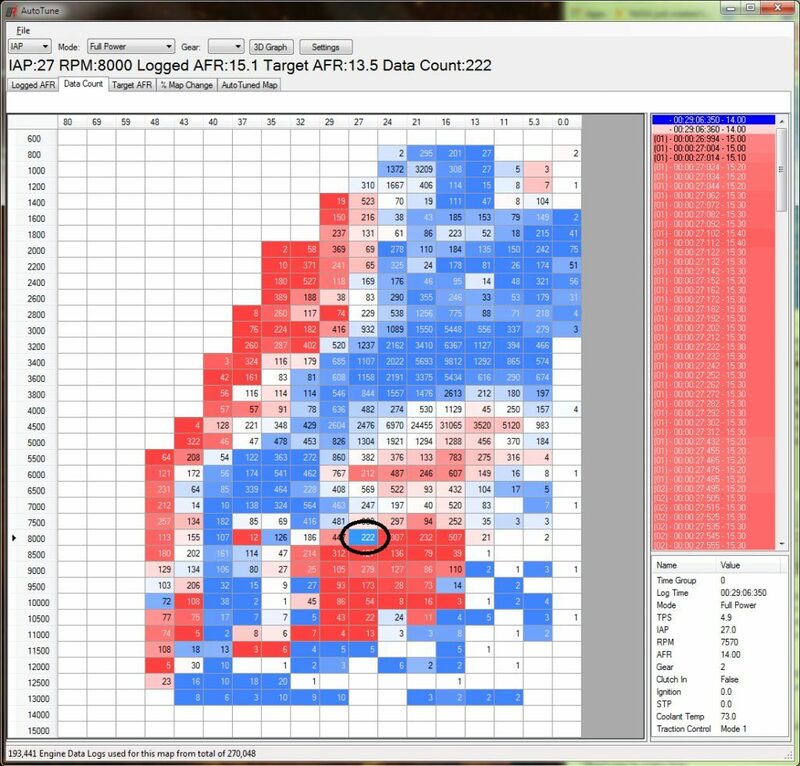 In the example above you can see that I’ve clicked in the cell at 8,000 RPM at 27 IAP and that there are 222 data points for that. 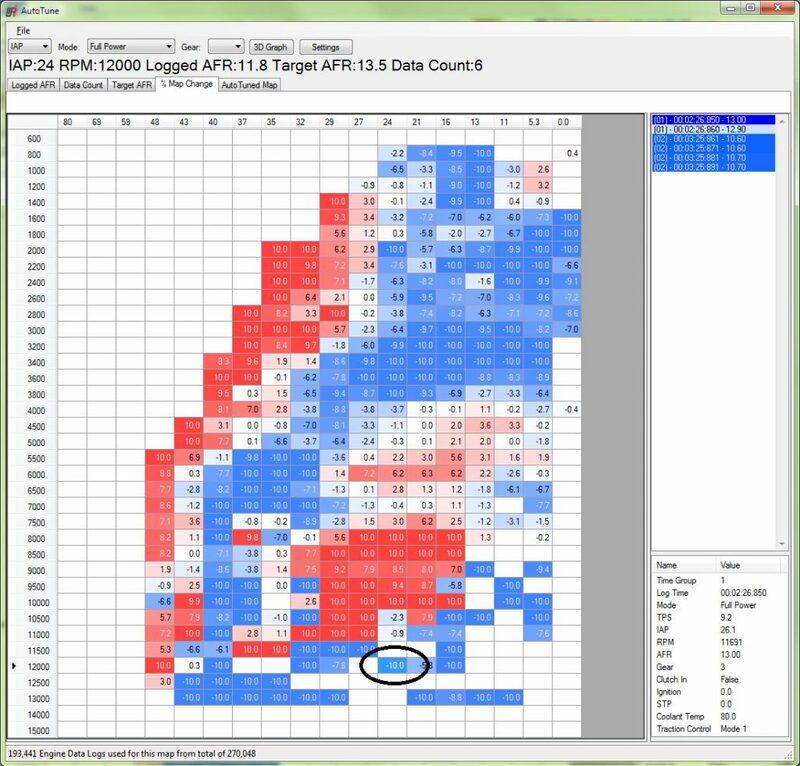 Along the very top of the screen you can see that the logged AFR is 15.1 and the target AFR is 13.5 for that specific cell. 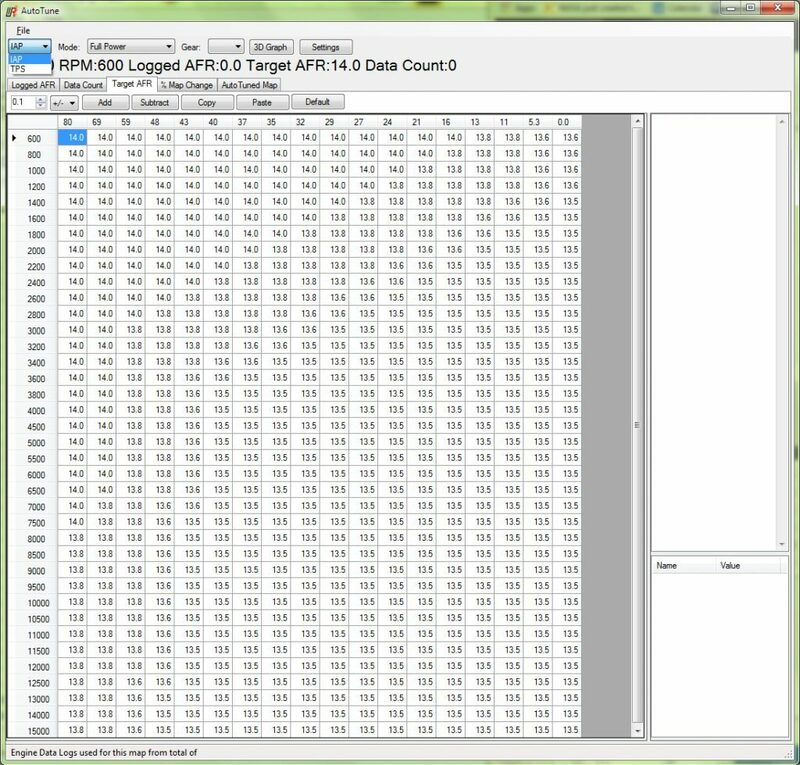 Along the very bottom of the screen you can also see that I have 193,441 data points analysed from a total of 270,048. Why’s that? Remember how we configured the AutoTune settings earlier? We told it there to filter out data until the coolant reached 80C, the AFR was less than 10 or greater than 17.1 and that we wanted a minimum of two data points per cell. These are the current default settings for WRT version 1.8.1 as at the time of writing this article. 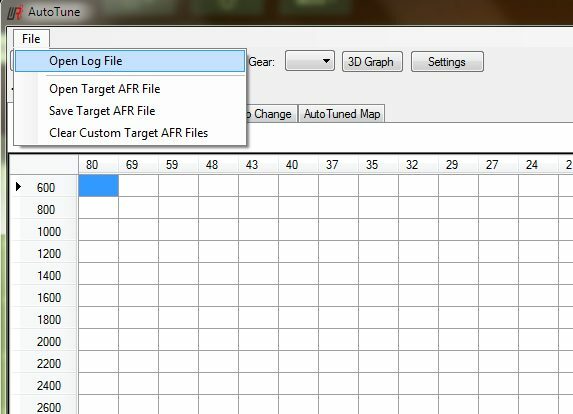 If we then click on the “% Map Change” tab along the top, we can see what the AutoTune part of WRT wants to change the fuelling to to meet our target AFR for that cell. In the screen below a 10% reduction is called for. Remember too that we told the settings in AT to make a maximum of a 10% change only? Good. In my opinion and backed up by correspondence with Justin don’t be tempted to change that to allow a 50% change, stick with a maximum 10% change unless you have done ultra serious tuning, in which case you’ll know what you’re doing here. Finally the “Auto Tuned Map” tab shows you want WRT will set your fuelling to if you click on the “Apply Auto Tune” button. You can click on the “Show Original Map” button and see what the original fuelling was like. 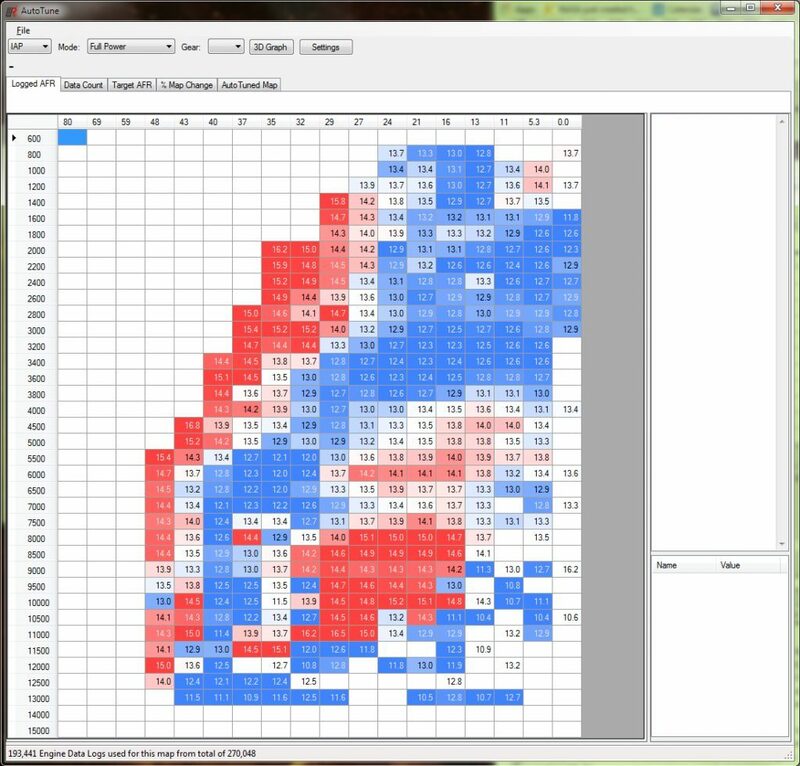 You can also press CTRL-A on your keyboard to highlight all the data on this screen and then paste it into Excel or similar for further analysis or for posterity. Now that you’ve done that for your IAP map, don’t forget to apply that then go to your TPS map and apply that too. Then save your new map and burn it back to your ECU. Your Mileage May Vary: you accept any and all consequences for acting on the contents of this note. If you don’t know what you’re doing don’t act on this note. Even if you do know what you’re doing tread carefully. You can kill a bike and hurt yourself or others by changing your fuelling.